The classroom environment can be an extremely difficult place to navigate for a child with sensory processing difficulties. When a child has #sensory processing difficulties they can present in a number of different ways in the #classroom. Some being easier to pick out than others! The sensory avoidant child – Is overwhelmed by sensory input and will actively avoid it. This type of child is likely to appear anxious or overwhelmed, especially when the classroom is busy. They may hold their hands over their ears when it is too noisy, move away if others sit too close, avoid activities that require getting messy or abscond from the classroom. The sensory sensitive child – Is overwhelmed by sensory input but doesn’t do anything about it. This type of child may either hold things together while at school and then fall apart when they get home or may have constant meltdowns within the classroom. They may get angry at others for brushing past them because they feel like they were pushed, they may overreact to small bumps and scratches and have a lot of difficulty concentrating when the classroom is busy or noisy. The sensory seeking child – Does not receive enough sensory information from the world around them so actively seeks out more. A sensory seeking child is likely to have a lot of difficulty sitting still, constantly want to touch or fiddle with things, may be rough with others without meaning to be, may hum to themselves or make a lot of noise. This type of child is often labelled as being ‘naughty’ because they physically can’t stop themselves from moving around and touching things. A child with low registration – Does not receive enough sensory information but does not do anything about it. This is the type of child that appears to be in their own world. They often appear to lack energy, often slump in their chair, may accidently bump into things or other people and often miss instructions or information. As you can imagine all of these different sensory profiles make it difficult for a child to interact appropriately within a classroom environment resulting in difficulty achieving their academic potential. So what can be done to help these kids without removing them from this stressful environment? Encourage regular sensory breaks throughout the school day. Ideally the child will be engaging in sensory activities at home as well in order to assist with regulation prior to arriving at school. 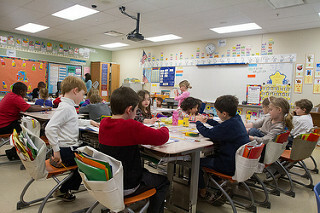 Provide a quiet space/corner in the classroom in which the child can retreat to if feeling overwhelmed. Ensure you have eye contact from the child when giving instructions and ask them to repeat them back to you to ensure they have processed the information. Forewarn the child when possible if the classroom is likely to get noisy or of loud noises like the school bell. Provide fidget toys for a fidgety child to decrease them fidgeting with inappropriate objects or touching others. Provide a visual schedule so the child is able to check what is coming next or refer to it if they have missed information. Highlight important information on worksheets. Provide a carpet square or similar to mark the child’s spot on the mat so that others don’t get into their personal space and vise versa. Try not to tell the child off or punish them for sensory related behaviours as it is very unlikely that the child is consciously trying to do the wrong thing. These are just a few ideas and while helpful for a lot of children will not work with all children due to differing sensory needs. Working with an Occupational Therapist will allow further customised strategies to be determined in order to allow a child with sensory processing difficulties to engage in the classroom to the best of their ability.